Yes, those are hitching posts in the background. It has been a couple weeks since my ankle sprain and I felt like checking my confidence in it. 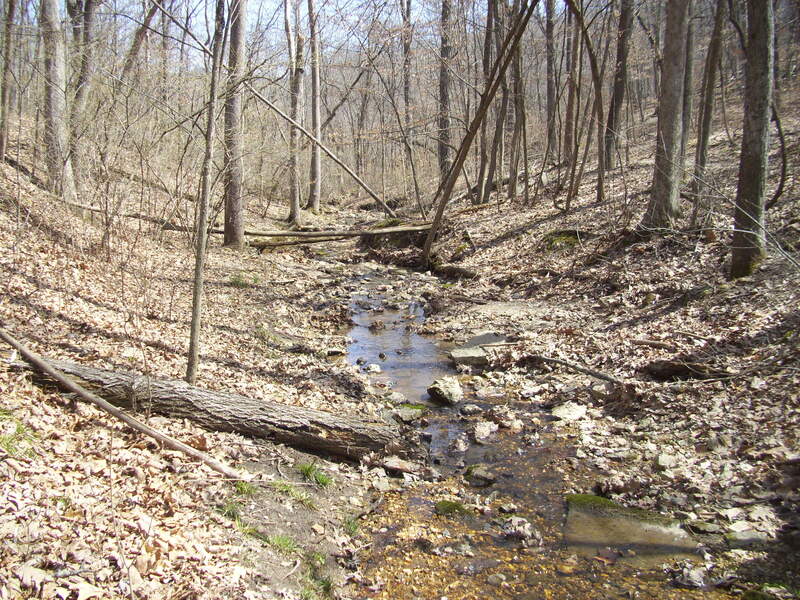 It was time to go out to Greensfelder Park behind Six Flags and hike the Eagle Valley Trail. 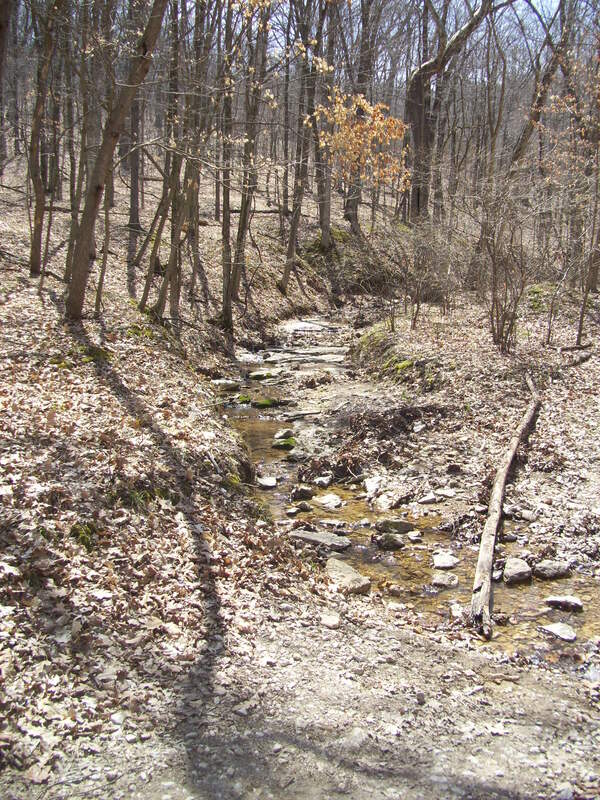 It is about 3 and a half miles down the hill, through the hollow along the stream, and back up another hill. But it’s a bit more than that. If you know of Greensfelder, then you are probably involved in horses or off-road biking. I don’t know exactly why, but this park is a favorite of horse riders and mountain bikers alike. Gateway Off-Road Cyclists does trail maintenance out there from time to time, and if you head out there on one of the nicer weekends, you will be sharing the trail with all sorts of modes of travel. Makes for a neighborly hike, so pack your etiquette with you! It’s probably 20-30 minutes from 44/270. Take highway 44 west to the Six Flags/Allenton exit #261, make a right towards the Six Flags entrance, and follow the road that goes around the left side of Six Flags. As you head into the park you will pass a couple of trail-head parking lots and the entrance for the park loop road. A little further on your right you will come to the visitor’s center and you want to turn into this parking lot. 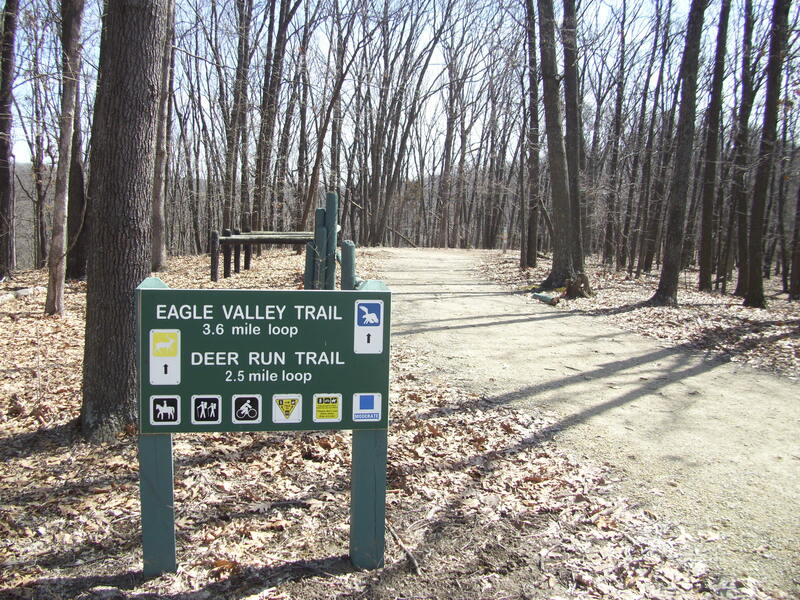 At the far end on the right is the trail-head for the Eagle Valley and Deer Run Trails. You’re gonna get to know this little stream really well. The Eagle Valley Trail heads straight out from the parking lot following the extending ridge and then down along the hill’s right side, eventually switching back and forth a couple of times until you get to the valley bottom and to the stream. Then it follows the stream, with frequent crossings, for quite a ways through a very pretty area. After it has changed direction to the left, you will finally get to your last (maybe) water crossing. It then starts a couple of long switchbacks up the hill to a scenic flat spot (this would be a great camping spot if the weather was good) at one end of the ridge of the hill you are on. It switches back again and you follow the ridge steadily up and toward the little loop for the equestrian camping. It runs along the left of this area and then curves sharply to the left and hooks around behind the other camp sites in the park. After this curve, when you first get to these camp sites along the road, you can hike up through the first one in front of you and cross the road to rejoin the trail if you want to cut a half mile off your hike. If not, the trail parallels the road and then turns to the right and crosses it, and then follows it back in the opposite direction from which you came. It will turn back to the left and you should be able to see the visitor’s center and parking lot in front of you. 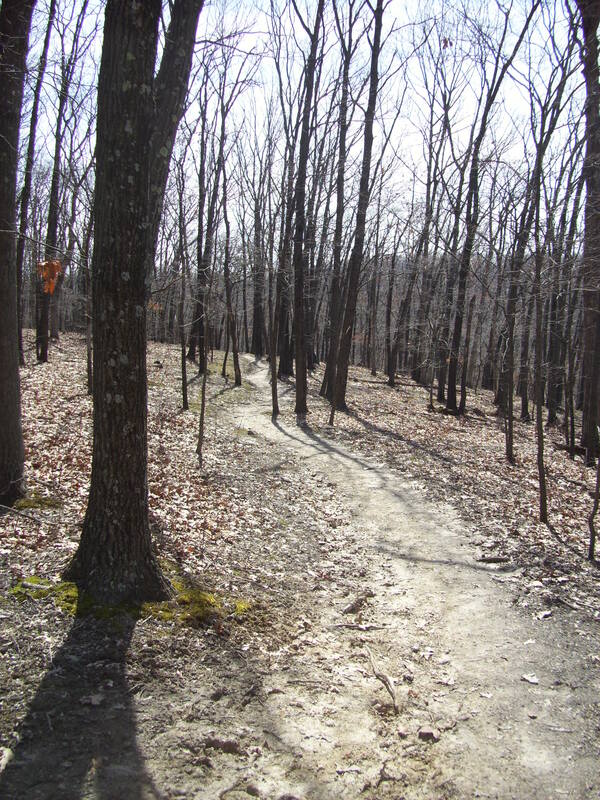 Follow the trail around to the trail head or do some short leaf-litter-bushwacking back to your car. 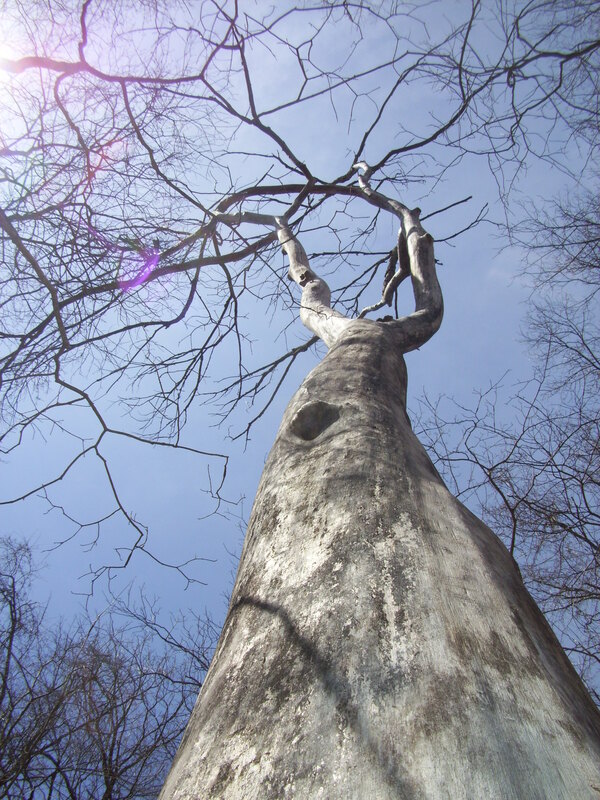 All the bark from this tree was laying around it, like the sun came out and it just dropped all its clothes. Sometimes it’s fun to see horses on a trail. Maybe I just see the sparkle in my daughter’s eyes when she sees a horse and rider, or maybe I have that sparkle too. Sharing a trail with more than just other hikers can make for a memorable excursion. The stream. My favorite trails have some sort of water feature, and this one follows it for probably a mile and a half at least. Go in the early morning and catch a peek at all the deer in the area. There is a lot of life along a stream. I would throw this trail in the “Moderate” category. As this trail gets traffic other than just human feet, it tends to be wet and trodden. 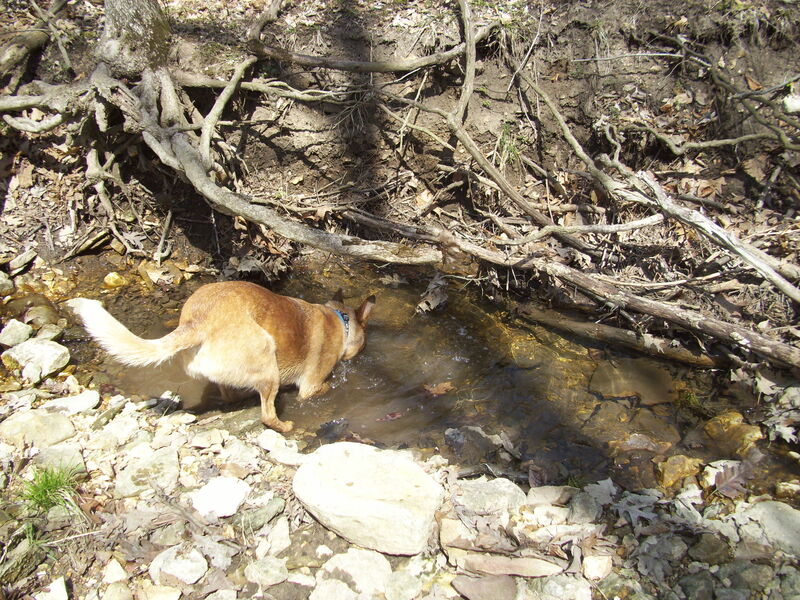 You will come across some muddy sections, even if it hasn’t rained recently, and there are a lot of stream crossings. Don’t wear your house slippers. Also, with that other traffic comes the need to accept that you should practice patience and courtesy as you hike. Remember that everyone out there is out there to enjoy it like you are. Do everyone a favor and carry your water bottle and snack trash out with you and properly dispose of them. I realize that statistically you are going to get some discards because people accidentally drop things and some people just don’t care. But in 3 and a half miles I had a bag with about five cans, four sports drink bottles, some food wrappers, and a discarded boot. Let’s keep the pretty areas pretty. If you take this trail in the direction that I do, that climb up the hill after the valley can be challenging due to it’s steepness. Go in the reverse direction if you want a slightly easier climb on the way out. There are other trails at Greensfelder, and I have only recently hiked one of the others, but this one is my favorite so far. Go check it out! I just hiked Eagle Valley yesterday, July 28, it was great weather, a few other hikers and horseback riders along the trail which just added to my wonderful hike! I usually add to my hike and connect with The Mustang Trail which is rugged and I’d say moderately difficult but beautiful, so if you’ve not tried this trail, may I suggest you do…..I believe you’ll enjoy it:)). I really love this state park and all it has to offer. It’s amazing out there! The Eagle Valley Trail is just about my favorite trail near St. Louis! There’s just something amazing and remote about it that is hard to find in some of the other places around. And I did just recently hike the Mustang Trail for the first time, which you are completely right about it being rugged. Totally worth it though, to get to that flat spot along the creek. And not to come off as some sort of know-it-all, but Greensfelder is actually a St. Louis County Park. It sure seems like it ought to be a State Park because it is so big and so far out there. Glad to hear what you have to share, Annemarie! Have a great week!